‘Coming Soon Pro’ is a useful WordPress Plugin to help build a great looking launching soon One Pager. The plugin allows you to capture leads with various email list providers. Make sure you check out the showcase to fully experience what you can do with the plugin. Other features include translation & multilingual options, countdown timer, progress bar and background videos. 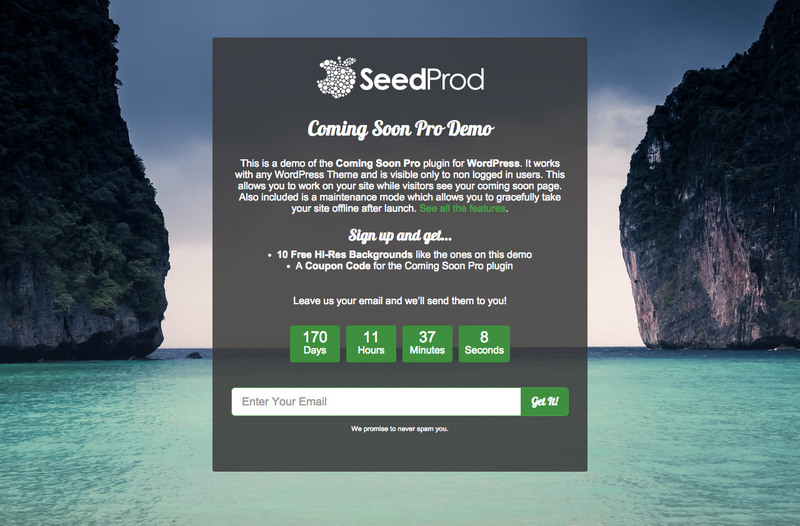 Coming Soon Pro by SeedProd allows you to easily create a stunning Coming Soon or Maintenance Mode page while your site is under construction. It allows you to captures leads with various email and plugin providers and give clients or other visitors limited access. Also it allows you to hide your site while it’s under construction from the public. The plugin includes a flexible default theme with various design controls to make the perfect coming soon page or purchase a pre made premium theme and save yourself the time. The plugin also integrates with many leading email providers and plugins. Including: MailChimp, Mad Mimi, Aweber, Constant Contact, Campaign Monitor, GetResponse, FeedBlitz, Follow up emails for WooCommerce, MailPoet formally WYSIJA, Gravity Forms, MyMail .getDrip.com, Sendy.co, iContact, Infusionsoft or use a Web Form from any 3rd Party Provider.